Following the recent success at the end of last year, we will be running are 2nd inter-club colours team gala 28th April. Please find attached the flyer for more information about the event. Squads invited: Academy Gold, Skill Development, Competetive Development, Performance Bronze, Performance Silver, Performance Gold, National Squad. 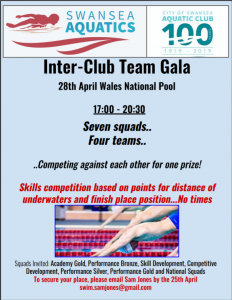 The events will be run at Wales National Pool on the 28th from 17:00-20:30 competing in the small pool in four teams. The teams will be competing for points based on finish positionings and underwater distances off the walls..no times. The events it completely free to take part, once teams have been announced we ask swimmers to wear the team colour they have been assigned. As it will be easter the general theme can be based on this time of this year i.e. easter bunnies hats. To run the event we are looking for volunteers parents and swimmers to help run the event on the day i.e. officials, team managers, swimmers to support the younger club swimmers on the day so anyone in Performance Silver, Performance Gold, National and University Squad who along with parents who want an active role in just helping the coaches on poolside please let me know. Squads taking part on the 28th, regular training will be cancelled due to the gala. If you want to compete in the fun structured event please email me no later than 25th April. Team Lists will be announced on social media after this time.